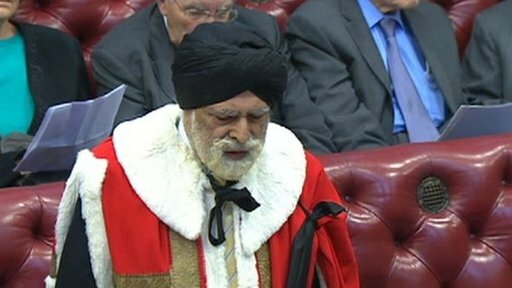 Reports today indicate that Lord Indarjit Singh, the first turbaned Sikh to serve in the British House of Lords, has declined the invitation to attend the opening event of the 2012 Sikh International Film Festival in New York — the Heritage Awards Gala (in which he was to be awarded) — in objection to the attendance of representatives of the Government of India. Ever since 1984, I have campaigned tirelessly for those responsible for this genocide against Sikhs to be brought to justice through articles in the Sikh Messenger , the Journal of Amnesty International, articles in the Times, the Guardian and other British, French, American and Arabic journals and in radio and TV broadcasts. My effort and those of many others for the Indian government to respect civilised norms and bring those responsible to justice have simply fallen on deaf ears. This is a very bold and brave statement made by Lord Indarjit Singh. Three days ago, I wrote about the incomprehensible actions of the 2012 Sikh International Film Festival in New York to invite and honor representatives of the Government of India during the very same week that Sikhs around the world will be commemorating the 28th anniversary of the state-sanctioned massacre of Sikhs in New Delhi and around India in November 1984, for which no significant measure of justice has ever been delivered. It is encouraging to see that prominent Sikhs are taking a similar stand of conviction. Kudos to Lord Indarjit SIngh — if more Sikhs were willing to walk the talk then the perpetrators of 1984 would have been brought to justice long ago. Let’s hope that the organizers of the Sikh International Film Festival make use of this opportunity to sensitize themselves to the issues surrounding 1984.